The Honest John Awards were held yesterday, and the Mercedes-Benz C-Class won the Most Popular Compact Executive Car with the Mercedes-Benz W 124 series named Most Popular Classic Car. MILTON KEYNES, UK -- May 21, 2015: The judging process reflects the Honest John website users with Awards given to vehicles receiving the most interest and website visits. The site was created 15 years ago to help consumers with advice on buying, selling and running cars – receiving two million visits every month. The 124 series, introduced in 1984 was the first vehicle family from Mercedes-Benz to bear the name 'E-Class'. In a production period spanning 12 years from 1984–1996, the series underwent several revisions with global production totaling over 2.7 million vehicles. 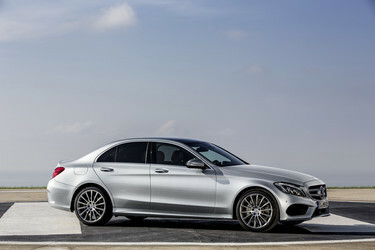 The current E-Class – priced from £34,870 OTR – includes a Hybrid as well as two powerful AMG variants, the 557 hp E 63 AMG and 585 hp E 63 AMG S. The E-Class remains one of the most popular models in the Mercedes-Benz line-up in the UK.